Since 1996, support for the death penalty has fallen 27 percentage points among independents (from 79% to 52%) and 36 points among Democrats (71% to 35%). 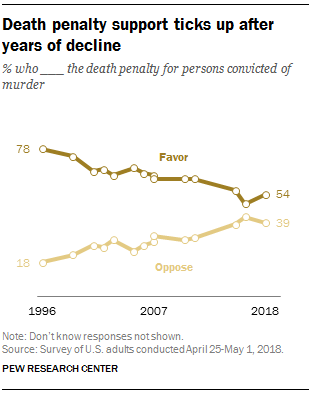 By contrast, the share of Republicans favoring the death penalty declined 10 points during that span (from 87% to 77%). The trends look somewhat different when considering a more recent time frame. Since 2016, opinions among Republicans and Democrats have changed little, but the share of independents favoring the death penalty has increased 8 percentage points (from 44% to 52%). Support for the death penalty has long been divided by gender and race. In the new survey, about six-in-ten men (61%) say they are in favor of the death penalty and 34% are opposed. Women’s views are more divided: 46% favor the death penalty, while 45% oppose it. A 59% majority of whites favor the death penalty for those convicted of murder, compared with 47% of Hispanics and 36% of blacks. Young people are somewhat less likely than older adults to favor capital punishment. Those younger than 30 are divided – 47% favor and 46% oppose it – but majorities in older age groups support the death penalty. In 2015, a more detailed study of attitudes toward capital punishment found that 63% of the public thought the death penalty was morally justified, but majorities said there was some risk of an innocent person being put to death (71%) and that the death penalty does not deter serious crime (61%). Note: The full methodology and topline for the April 25-May 1 survey are available here (PDF).